Suffolk-based Greene King has agreed to pay £187m ($337m) for Belhaven, Scotland's largest independent brewer. Belhaven will keep its name, brands and East Lothian brewery following the 625 pence-per-share deal, which is 16% higher than its Friday closing price. Greene King, which already owns some of the UK's best-known beers such as Abbot Ale, is to raise £47m through a share placing to help fund the takeover. Belhaven's products include 80 Shilling, Best, and St Andrews Ale. 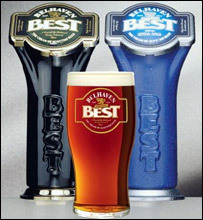 Belhaven Best, its flagship beer, is among the 10 most popular alcoholic drinks in Scottish pubs. Belhaven's 200 tenanted pubs and 100 managed pubs will now come under the umbrella of Greene King's estate of 2,064 pubs. "It is a unique opportunity for us to gain immediate scale in the important Scottish market," said Greene King chief executive Rooney Anand. However, the upcoming smoking ban in Scotland, due to start next year, may result in a "significant" cut in Belhaven's short-term profitability, Greene King warned. "This has been fully factored into Greene King's appraisal and valuation of Belhaven," the company said. 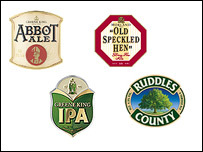 The purchase comes a month after Greene King completed the £46m purchase of family-owned brewer TD Ridley, which resulted in the closure of its brewery. Since 1996, Greene King has snapped up more than 1,600 pubs in eight separate deals worth more than £1.3bn. Belhaven chief executive Stuart Ross, said the company had achieved 15 years of unbroken growth and the cash offer reflected the quality of the business. "We believe that Greene King is the ideal partner for Belhaven," he went on. "The commercial models of the two companies are almost identical and we share the same ideals about the value of people, brands and heritage. "In Scotland, we can look forward positively to the future and we are confident that our assets, including our people, will make a meaningful contribution to the future growth and prosperity of the enlarged group." East Lothian MSP John Home Robertson said: "I'm obviously sad to see Belhaven lose its independence and I sympathise with the workers who will be feeling uncertain about the future, but equally, I'd be delighted if this takeover proves to be a springboard to further success and more jobs." He has asked for a meeting with Belhaven to discuss the employees' future.